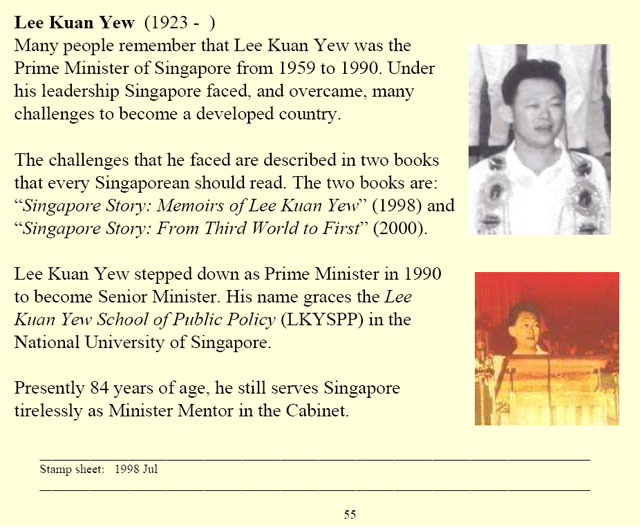 Many people remember that Lee Kuan Yew was the Prime Minister of Singapore from 1959 to 1990. Under his leadership Singapore faced, and overcame, many challenges to become a developed country. “Singapore Story: From Third World to First” (2000). Lee Kuan Yew stepped down as Prime Minister in 1990 to become Senior Minister. His name graces the Lee Kuan Yew School of Public Policy (LKYSPP) in the National University of Singapore. Presently 84 years of age, he still serves Singapore tirelessly as Minister Mentor in the Cabinet.